It’s snowing! The first real snowfall of the season started this morning where I live … setting the spirit to discuss holiday entertaining. Funny, Google "holiday entertaining” and you'll find a cornucopia of recipes for green bean casserole, cranberry sauce, and fancy cookies of every description. Feeding guests is a worthy tradition but if you’re looking for other ways to help folks feel at home in your home, suggestions are few and far between. 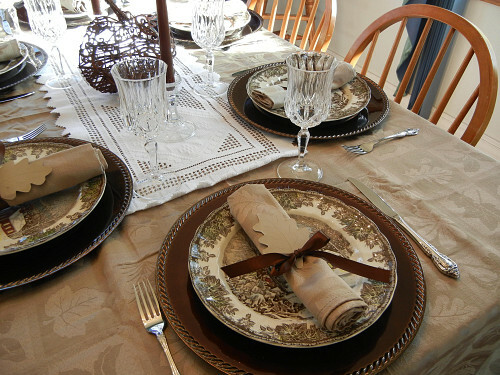 These 15 hosting tips for holiday entertaining fill the gap. Clear your driveway of snow. Even if you are snuggled into your house like the proverbial bug in a rug, your visitors need driveway access. Simple solution: Hire a contractor for regular snow removal – or have him install a driveway tent, which will eliminate the need for shoveling. Slip-proof the steps to your home. Install a non-skid stair runner – made of coir (natural coconut fiber) or recycled tires. Either one is a lot more eco-friendly than most ice melt products. Make sure that your doorbell is functional. If it’s not currently working, troubleshoot and repair the problem before friends and family show up at your door. Provide an entryway spot to sit and take off winter footwear. And have a waterproof space ready -- near a heat source, if possible -- to dry and warm your company's boots and coats for the frosty trek home. Prep your powder room. That doesn't just mean, “Put out your best scented soaps and fresh linens.” Go the extra mile; stock up on a good plunger, toilet brush, plenty of TP, and non-toxic room deodorizer. Make sure your bathroom vent fan is clean and in working order. Holiday meals can be rough on the ol’ digestive system. Liven up your guest bathroom with a quick coat of paint. Why not experiment with the Pantone Color of the Year for 2018 – dramatic Ultraviolet? Set up a coffee station. Make sure it's safely out of kids' reach and away from hot and heavy cooking action. As well as your coffeemaker, supply an urn of hot water and a selection of teas, herbal concoctions, and hot chocolate mix, so everyone can make their own warming beverage of choice. Clean your oven before a big festive dinner. Wait, what? Here’s why: a freshly scoured oven won’t smell of last week’s pizza when you’re trying to roast today’s turkey. It’s also much less likely to set off your smoke detector. Program your thermostat. If you are anticipating a large lively crowd, you’ll want the house comfortably warm when guests first arrive, then cooler as the party itself heats up. A programmable thermostat makes that easy. Keep friends and family safe from slips. Anchor your area rugs with double-sided carpet tape to hold them in place and prevent falls. Get some good scents going. Fresh flowers make your house smell good, but so do fresh cut evergreen branches or a cinnamon- and clove-spiked punch simmering in a slow cooker. Organize Grand Central (Charging) Station. Designate an end table or console for use as a multi-device charging station. It’s a practical and thoughtful gesture. Be a gracious give-ee. While it may be better to give than to receive, many of your guests will not show up emptyhanded. Accept host/ess gifts graciously with a dedicated space to set down bottles of wine, flower arrangements, and other offerings. Enjoy your party! Most important of all hosting tips: Don’t worry if your home isn’t perfect. Set a lighthearted, joyful mood and everyone will have the best time.